They look like hikers feet, mine are not as bad as they use to be but I still have to look for nails on my little toes, seems they gave up years ago. I won't say 'ouch', though I want to. But I will say 'ewww'. Can't you get steel toed hiking boots? The last time I lost a nail was on my thumb. I smashed my thumb a little bit at work. It didn't fall off. It just kind of stopped growing for a short time. It was a relief that it happened, in an odd sort of way. Oh, don't I know all about "Old Toenail"! I lost one of mine right before I was going to Florida for a trip and I superglued that mutha back on! A little bit 'o polish and that guy looked good as new. Okay, so Old Toenail let go a few days after we came home, but we did have one last trip together. Sigh. Good times, good times. May you enjoy your memories of Old Toenails and make many new ones with New Toenails! Eeeeeeek, this post sure brings back memories. I'm no hiker, but I did lose the big toe nail on my left foot after a big toe versus shopping cart incident. It sure takes a long time to grow a whole new nail again, but I'm pleased to say I've done it. I wish your toes speedy healing. 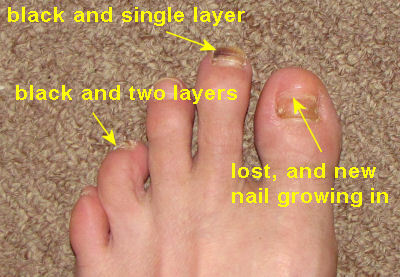 Carol- yeah... the little toe ones are tiny anyway, and one is split. Ratty- another clue about you... you use tools at work. Lin- Memories with New Toenails! Now that must be a title in search of an essay! Jaya- yup, it sure does take quite a while on those big toes! I stopped by for your contest. I actually read this when you posted it but I didn't comment at the time. This has been a toughie at times but I have picked up some new information.